Costa Bingo Mobile | Get Your £5 FREE Account Balance Here! Play now at Costa Bingo Mobile and you will receive £5 free no deposit required. On top of that, make your first deposit today and you will be rewarded with 120 free bingo tickets! 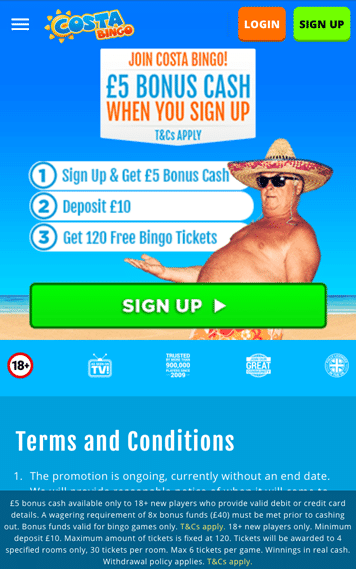 Aside from the massive incentives to join, you will find a massive selection of free bingo games, ongoing and regularly updated promotions, plus a fully functional mobile site and app. Costa Bingo is a fully mobile compatible bingo site. Whether you have an Apple or Android device, you will be able to play all of your favourite bingo games here. There are two different versions of the mobile site. The first is the app version, it can be downloaded from your respective app store. The downloadable version features rich graphics, easy navigation and the ability to do virtually anything you would do on the desktop version of the site. The second version is the mobile website. This can be viewed straight from your browser when you go to the official site. It’s fully responsive and allows you to play a wide variety of games, sign up, etc. Promo codes are no longer needed here. All of your bonuses including your £5 free no deposit, free bingo tickets on your first three deposits and access to the daily reload freebie are automatically applied. This means you can spend more time playing, and less time worrying about codes! 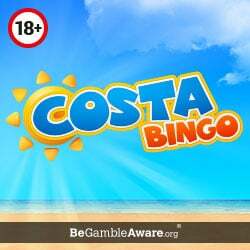 The distinguishing factor between Costa Bingo and many of its competitors is the fact that they run free bingo games for real money prizes 24/7. It doesn’t matter how long you have been a member, you will always have access to the free games. Prizes on free games are normally £1, so you won’t get rich, but they are a great way to have fun playing bingo for free. Apart from the free bingo games, Costa has a wide selection of other games, including 90 ball, 75 ball and 80 ball bingo. Tickets start from just 1p each, plus for funded players, there are some larger freebie games where you can win much larger prizes. Costa operates using their own version of Dragonfish software, so you won’t find another site exactly like it. They also use payment processing from Cassava Enterprises, so you can rest assured of fast and speedy transactions. The choice of slots games at Costa Bingo Mobile is vast. In total, you will find over 100 different slots, instant win games and casino games. So whether you fancy a spin on an award winning slot like Cleopatra or Fluffy Favourites, or just a good old game of Roulette, you will find exactly what you are looking for here. *£5 No Deposit: 18+ new players only. Valid debit or credit card details required upon registration. Offer valid until further notice. Bonus funds valid for bingo games only. 8x wagering requirement applies (£40). Max bonus conversion to cash capped at £100. General withdrawal restrictions & full T&Cs apply. Welcome Offer: Welcome Offer valid until further notice for 18+ non-funded players only. Minimum deposit £10. Maximum amount of tickets is fixed at 120. Tickets will be awarded to 4 specified rooms only, 30 tickets per room. Max 6 tickets per game. Winnings in real cash. Deposit balance is available for withdrawal at any time. General withdrawal restrictions & full T&Cs apply. 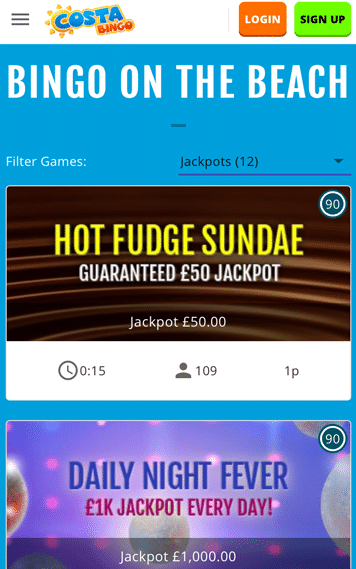 I would imagine that a decent proportion of the people reading this review will already have accounts with Costa Bingo Mobile, the reason for this is simple - they have been around a while and they provide one of the best bingo sites in the industry. If you haven't got one, I definitely think you should take the time to check it out. Getting started is 100% free, has no risk attached and provides larger bonuses and rewards than has ever been offered by Costa ever before. If you decide to create an account today you will immediately get £5 of free funds to play with. After that, if you decide to make a deposit, you will receive an incredible 120 free bingo tickets to spend in four special rooms. So if you haven't played at this site already, I demand you give it a go. It's right up there with the best, plus its 100% mobile compatible.